So cute and they sure fassinate the cats. My adult son's new kitten loves the balls. Son made a puzzle box and put one of them inside. Trying to get the ball out keeps the little fella entertained and is amusing to the people to watch. Two older cats are entertained watching "Junior's" antics! Cat toy. Lights up when cats are playing with it. I had never seen a toy like this. They are cute and the cats seem to like them. Sometimes I need to start them since the light automatically turns off when not being used. Bright multi colored lights. A disturbing warning came with these balls. The enclosed paper said cats may experience seizures because of the lights. Would not recommend anyone taking a chance and purchasing these. Am sending mine back. Wanted to give it zero stars but would not let me submit the review without a rating so I grudgingly gave it one. Smaller than I thought. Instructions say "strobe light might cause epileptic seizures". Has to be used with supervision only. 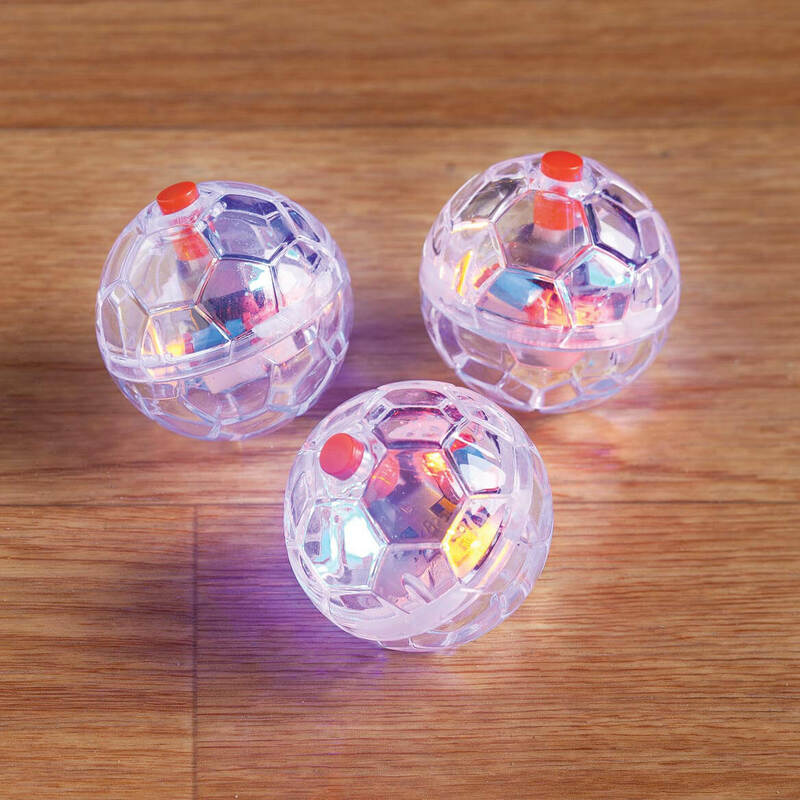 My cats will love chasing these balls. These looked like a fun toy for my "grand cats". Hopiing the motion activated toys will keep the cats busy when they want to play and not keep running when the cats are not playing with them. My cat is deaf, and I thought she might respond to a lighted toy. My daughters cats love motion activated toys. My kitten loves to play with things like this. I've tried something like this in the past and the cats love them! Have a new cat and thought it would be a fun toy. Big hit with the Kitties! My cat needed new toys. I want my cat to be active. Like to keep cats active at any age. Want to see how my cat reacts . Look like my "Grand cats" would enjoy them. I have two cats! They will love these! My cat loves them he's entertain all day. had some, stopped lighting up plus added kitten to household. They looked like they would be a fun distraction for my cat! I'm looking forward to having my friend's kitten stay with us so I can record their playtime together. I feel my 4 cats will LOVE these!! i have friends with cats and not to mention that I have a dog who might like it. My cat loves to play, and I'm not always home to play with him. We will see if it works. Love my cats... These look interesting. Can you replace the batteries in these? BEST ANSWER: no, cannot replace the batteries and the lights do not glow after a few weeks.